This morning, Linda Rief is once again leading us in some early morning writing activities. Our work today is on crafting our pieces. She gave us a wonderful example of how a student had responded to the prompt, "What (blank) is not." And, of course, my thoughts turned to books and reading. In some ways, this makes great sense to me, writing about what reading is NOT. In many ways, defining what reading is exactly is nigh on to impossible. But I do think I can point to some examples of what is NOT reading. 1. Reading is NOT answering questions at end of a passage or a chapter or a book. 2. It is not pausing to fill out some notebook or worksheet at the end of a page or a chapter or a book. 3. It is not making some project over the book. Cue the dioramas! 4. Reading is NOT everyone reading the same book at the same time all year long. 5. It is not being assigned a certain number of pages to read a night or a certain number of books to read over the summer. 6. Reading is NOT just. Looking at the words, just comprehension, just identifying themes and main ideas. 7. It is not parsing and dissecting when such activities are driven by someone else. 8. It is not looking up vocabulary words before you can even begin to read. 9. It is not always a public act. 10. Reading is NOT, it is NOT, it is NOT staying within the four corners of the text (sorry David Coleman). I see a lot of NOT out there. Time, access, choice, response: these ar elements that need to be present if we are to see what reading IS and what it CAN BE. 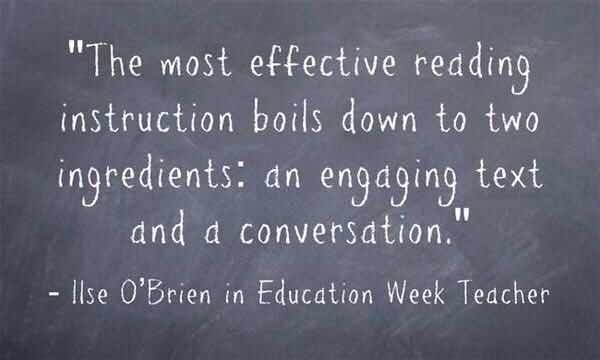 If we wish to witness what reading is NOT, we can just stay with the kits and the programs and the one-size-fits-all approach.